We have reached the days of summer when we can catch a glimpse, if we squint into the glare of the hot sun, at what our gardens could become if we left them alone to fend for themselves. Because we are leaving them alone, or at least I am. Driven indoors on hot days when every dog, cat, and rabbit seeks out the shade from mid-morning on, I watch from the windows to see weeds take root and grow where I happily and hopefully cultivated my garden earlier in the spring. Thistle and morning glory. Prostrate spurge and false daisies. Foxtails and lamb’s quarters. And yes, even purslane. They have their seasons like all flowers and these hot days of summer are their season. It’s scary at times to think how during the hottest days of summer, we can let the garden go right to the brink of wild. It happens before we know it when it is so hot and humid. We skip a day or two or three in the garden, only running out for just a few minutes to gather a few tomatoes or some overgrown squash or to take some pictures of weeds. Then we turn around and look at the garden and see that it is on the edge, dangerously close to the brink of wild. But I won’t let the garden go over that brink, that point of no return, or return only at great cost. The temperatures will start to get cooler one day. The rains will come. And once again, I’ll be out in the garden pulling weeds, or at least chopping them down, making room for what I really want to see in my garden at this time of year. It’s part of the cycle of my garden, and has been for years. I know how far I can let the garden go to the edge, to the brink, and still bring it back. It’s almost to that point now. In just a few more days, perhaps by the weekend, it ought to be right on that edge. I’m not necessarily proud of this phase of the garden, but it is what it is and it always happens this way. After a morning or two of weeding, and maybe an evening or two of pruning a few shrubs back, my garden should be back where I’d like it to be, away from the edge, that brink of wild and no return. It should be a place where all my weeds are wildflowers, where there is hope of a green lawn in the fall, too soon sprinkled with fallen leaves, and this year, where there is a fresh palette for the fall planting phase of my newly designed gardens. And that pallet will hopefully be filled with a few wildflowers and other native plants, so I will have something other than weeds and words to share on Wildflower Wednesdays, hosted on the fourth Wednesday of every month by Gail at Clay and Limestone. Carol, I think most experienced gardeners know their gardens well enough to recognize the warning signs that they're approaching that brink. We've learned not to get too worked up over it ... just get started and keep going until the garden is back where we want it to be. "it is what it is and it always happens this way." I am starting to recognize this about my non-vegetable garden. Still not quite reconciled to the idea that every year it will get out of hand & I will have to bring it back. But so far, for over 20 years, it's always happened that way--except for a few years where it did go over the edge in a few beds. I am managing to retain control in the vegetable garden by the pool and even added edging to it last week for easier mowing. The corn patch and potato bins are out of control. It happens. Don't sweat the small stuff. I know just what you mean Carol. I run out in the morning to do my jobs, watering, deadheading, gathering any veggies and then run in dripping. I have plants to put in the ground, but they stand there in the corner of my patio gasping for life. I went to Home Depot today to look for a few things. I couldnt wait to get out of there, breathless, I picked up some more darth vader materials to get those insects! Hi Carol, I've never really gone in for control, so the slide into chaos is pretty seamless around here! Your weeds and words are quite nice, but I look forward to seeing the natives in your new gardens. Control, is an overrated concept in my garden. I go for controlled chaos. Everyone is happy that way. Spring and fall I work in the garden and in the summer, lazy in a chair reading a book, I guess you could call me a lazy gardener. Nice post, Carol. It's good to remember that the garden doesn't have to be perfect, that when the dog days of summer have got you down, it's OK to let things alone for a while. I do that every summer in Austin. When fall arrives, I'll be glad to be back outside again, even to pull weeds. Yes, my garden gets pretty wild this time of year too. I look at all those weeds and wonder how I let it get to looking this way. Cooler temps will follow I will tame it once again. I went so far as to make a list of weeds that are growing in my garden right now. Ha... It is and incredibly long list. My garden is also on the brink. It's raining this morning so I'll be on a weeding frenzy in the next few days. The crab grass is as big as cabbage! Ah, you've been reading my mind again, only you express my thoughts so much better than I ever could. Yes, my garden is on the brink these days, too, and, as I sit inside in the cool reading my latest book, I just hope it doesn't fall over the edge. Carol, you expressed exactly how I feel. 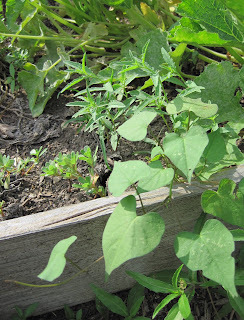 This time of year, I go out in the morning, and it seems as if the morning glory, purslane et al. have grown three feet in the night. So, I pull and pull runners and roots trying to get at them all. I am always amazed at how quickly those weeds can grow at this time of year with the heat and the lack of rain. I could spend every day weeding and have to start all over the next morning. So it's really efficient to let it get to the brink of wildness, don't you think?